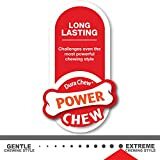 This Nylabone Power Chew Dura Chew Pro Action Dog Chew Toy gives your dog the dental care and chewing satisfaction he needs to stay healthy and happy. 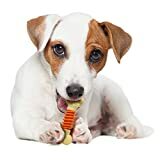 This bacon flavored chew toy has durable nylon ends made for powerful chewing and softer ridges in between, making it a dog dental chew toy that helps freshen breath, massage gums, and clean teeth with triple-cleaning action. 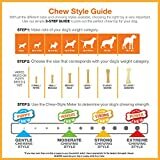 A dental dog toy and chewing fun all in one! 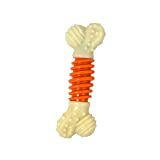 Interested in the Nylabone PRO Action dog Bone Dental Chew Toy, Small? Is the price too high? You can easily price watch this product and we'll notify you when the price reaches your target.